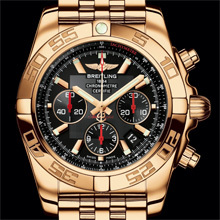 Breitling introduces its flagship Chronomat 01 model in a limited series endowed with exclusive finishing and a transparent caseback providing a fascinating view of the 100% in-house made chronograph caliber. A close-up look at elegance and top-flightperformances. 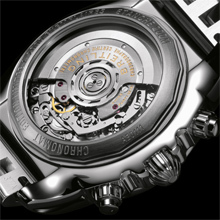 First introduced in the spring of 2009, the Chronomat 01 was the first Breitling watch to house Caliber 01, a chronograph movement entirely developed and produced in the brand’s workshops. 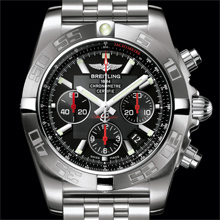 The leading model in the Breitling collections, this instrument is distinguished by the powerful character of its case, its bezel engraved with original numerals, and its distinctive blend of strength and elegance. Available in a number of different versions, it has established itself as the new benchmark in the field of mechanical chronographs – and indeedas the ultimate chronograph. of the in-house made chronograph movement. An exceptional glimpse of this high performance motor boasting a column-wheel, an entirely original architectural design, and assembled according to a revolutionary industrial process. Breitling Caliber 01, officially chronometer-certified by the COSC, selfwinding, high frequency (28,800 vibrations per hour), 47 jewels. 1/4th of a second chronograph, 30-minute and 12-hour totalizers. Calendar. Steel or 18K rose gold. Water-resistant to 200 m/20 bars (100 m/10 bars for the gold model). Screw-locked crown and safety pushpieces. Unidirectional ratcheted rotating bezel. Cambered sapphire crystal, glareproofed on both sides. Transparent sapphire crystal caseback. Diameter: 43.50 mm. Dial: Onyx Black. Pilot in steel or rose gold.